"If many Fenwickians seem to resemble each other, this may be ascribed to the influence of its founder, who was in every way possible, the father of his country." There is still a topical, somewhat familiar sense of satirical relevance to Jack Arnold's 1959 broad comedy The Mouse That Roared, in which a tiny, broke nation declares war on the United States in the hopes that it will quickly lose and then receive oodles of post-war aid. Our country's habit of throwing gobs of money and resources at a vanquished military foe is admirable to a degree, and in the case of the minute country of the Duchy of Grand Fenwick, it seems like an easy means to an end when their principal U.S. export (a tasty Pinot wine) stops selling, and the country quickly lurches into bankruptcy. 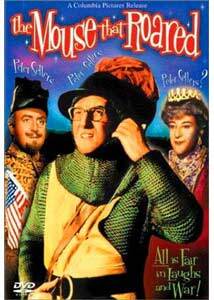 The Duchy, a seemingly medieval hamlet allegedly nestled in the French Alps, launches its "attack" on U.S. by sending an army of twenty chain-mail-adorned soldiers to New York City to surrender, led by the slightly bumbling Tully Bascombe (Peter Sellers). Their arrival, during an air-raid drill when all of New York has been ordered underground, makes surrender difficult, and that is when the story becomes a lightweight variation on the nuclear war black humor of Dr. Strangelove, as the presence of an all-powerful Q-bomb (one character says it could "blow up North America and part of South America") threatens world peace when it falls into the hands of the invading Fenwickians. Jack Arnold, venerable director of one of my favorite horror films of all time (The Creature From the Black Lagoon), understandably plays out the story as more of a comical farce—even utilizing a silent-movie-esque score during the wacky climax—than a face-slapping political comedy. The complete, apparent emptiness of New York during the air raid drill (so over the top to never be remotely believable) is balanced by occasionally smart, well-written dialogue that is less exaggerated humor than it is (or perhaps was) biting social commentary. The film itself is best remembered as a vehicle for Sellers to be able to play three roles, though that is really more of a throwaway gimmick than a necessity. His (in drag) portrayal of the Duchess of Fenwick is humorous, but exists only for a few well-placed one-liners more than anything else. Likewise with his turn as Grand Fenwick Prime Minister Mountjoy, a Snidely Whiplash-like character whose presence as the originator of the attack plan is key to the film, but not so that it needed to be played specifically by Sellers. The Duchess and the Prime Minister are not much more than filler to be plopped in-between his immediately likeable performance as Tully Bascombe. Looking a bit like Elvis Costello, Seller's Bascombe remains a comparatively believable character in a film filled with one-note, familiar stock types (the gruff general, the cocky New Yorker, etc. ), and even when he develops a gentle crush on adorable Jean Seberg's prisoner-of-war Helen, Sellers plays it not as a slapstick-y Clouseau, but as a regular, nervously shy guy. Prior to watching this disc, I hadn't seen The Mouse That Roared in quite a few years, and I was half expecting some of the humor and political relevancy to have either faded or become horribly outdated. Sure, the flat militaristic portrayal of the U.S. is a bit stereotypical, but the underlying plot still holds up as a source of comedic fodder. Image Transfer Review: Presented in a surprisingly lively 1.85:1 anamorphic widescreen, Columbia TriStar's DVD treatment of The Mouse That Roared really imbues the film with a bit of fresh air. After having seen it countless times over the years in a nasty, chopped full-frame broadcast format, the widescreen presentation, even with all of its generally inherent age issues, looks quite good. Colors are not exceptionally bright, but for a film of this vintage there is a solid and pleasing consistency to the entire transfer. With the good comes the bad, because now some of the process shots perhaps look it bit more glaringly fake, and the presence of some mild flicker and specking is evident. Audio Transfer Review: A very clean original English mono track, devoid of any hiss or crackle, does a fine job of presenting the dialogue. Extras Review: All we have for extras is a trio of trailers (The Mouse That Roared, Dr. Strangelove, Don't Raise the Bridge, Lower the River). The disc itself is cut into a respectable 28 chapters, and features subtitles in English and French. Though it spawned a forgettable Richard Lester-directed sequel (The Mouse on the Moon), minus Peter Sellers in 1963, this 1959 comedy from Jack Arnold still has legs as a rather funny and entertaining film. From its silly Columbia-Pictures-lady-with-the-torch opening gag to the jokey mock-serious narration, all of it is anchored by Sellers' endearingly pleasant Tully Bascombe. Columbia TriStar gets a nice pat on the back for its 1.85:1 anamorphic widescreen transfer, though they get a swift kick in the shins for a back cover summary that reveals the entire film.